When it comes to updating your movie theater lighting, you may be wondering where to even begin. Alongside our retrofit management team, our lighting specialists have helped to update movie theaters around the country with more energy-efficient, longer-life lighting. These upgrades are tricky, though, because guest experience and the ability to dim auditoriums well is of utmost importance to theaters. And, the truth is, not all high-efficiency products will cut it. 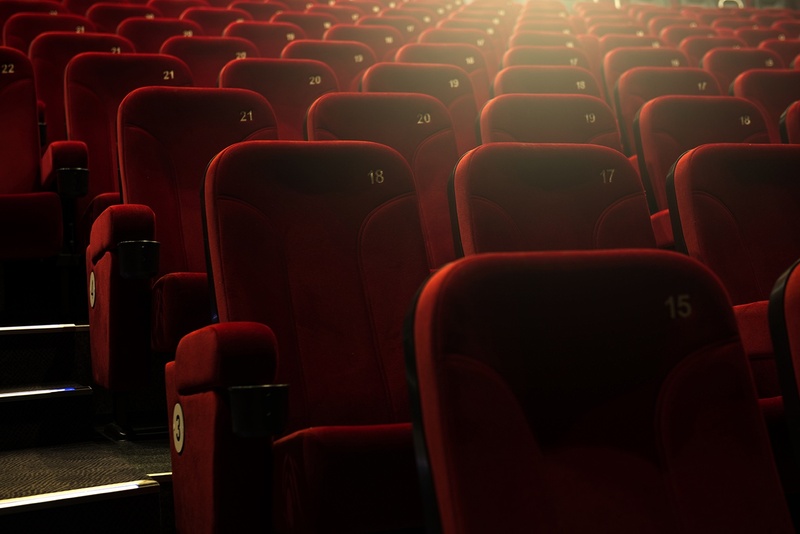 There are three main areas to address in movie theater lighting: exterior lighting applications, common area lighting applications, and auditorium lighting. We've compiled a list of the most common products you will see in these applications and the best retrofit products to consider. When determining what lighting you're looking to retrofit in a movie theater, the exterior lighting may be the last place you think of. However, it is one of the most important places, and a great opportunity for significant energy and maintenance savings. This is where you attract customers and set the mood of your theater. Marquee/signage lighting (commonly S14 shape lamps) are typically retrofitted to LEDs that are weather rated since they must withstand the elements. You also want to keep the attractive color characteristics of traditional marquee lighting, and low-quality LEDs with a greenish hue may leave you disappointed. Currently, American Lighting and Ushio make some fantastic S14 LEDs for this application. Moving from an 11 Watt incandescent S14 bulb to a 2 Watt LED S14 bulb is more than an 80 percent reduction in energy alone and can really add up. Many poster cases still have T12 fluourescent lighting but can be retrofitted to linear LEDs. This option takes some coordination because you have to consider whether a direct-wire or plug-and-play linear LED is better. Plug-and-play offers many advantages but also requires the installation of a new ballast. Another option may be specifically purposed LED sign lighting illuminate the posters. To help your guests feel safe and secure — and to save significantly on energy and maintenance costs — LED is a great option to replace existing HID wall packs and pole lights. LED fixture replacements are a great option, but we’ve also seen a number of plug-and-play lamp replacements from reputable manufacturers that have a lower up-front cost and perform well. In your lobby, recessed cans often make up the majority of fixtures. Many theaters still have pin-based CFLs installed in these cans so retrofitting to LED can garner a large amount of savings. The high ceilings in most lobbies also make the process of changing burned-out bulbs a pain, meaning that the long life of LEDs could also make your life a little easier. Philips and Lunera currently have great retrofit options for these applications. There are also some long-life fluorescent options that can make maintenance easier if you aren’t ready to take the plunge to LED in these applications. One benefit you may consider for LEDs, though, is that the versions with a plastic housing and lens are a great fit for food preparation areas where you would normally have to use coated glass lamps. Tip: These products would also work well in linear fluorescent cove lighting applications. These may be present in the lobbies or hallways. In addition to linear fluorescents or recessed cans addressed above, decorative lighting is common in the hallway areas. Fixtures we see include wall sconces, accent lighting, and other decorative fixtures. Wall sconces in non-dimming areas often contain plug-in CFLs that can be substituted with a plug-in LED option such as the Helen from Lunera or the InstantFit from Philips. The theater/auditorium is the most important location to have top-notch, quality lighting. You want your guests to have a great movie-going experience, not distracted by the lighting. The recessed cans need to be completely dimmable but also bright enough for employees to clean the auditorium between shows. In this scenario we often see a BR30 halogen or PAR30 halogen lamps. Note: This graphic was provided by Philips. Not all Philips LEDs warm as they dim. If you’re considering these products, it would be worth reaching out to a lighting specialist. Wall sconces used in the auditorium also need to be dimmable with a warm tone. If you've ever sat in a theater and glanced over to the wall sconces during a movie, you've probably noticed they're still on with a nice warm glow. They are meant to support the comfortable inviting atmosphere, so the visual is important. This is another example where LEDs that warm as they dim are worth real consideration. Switching to more efficient lighting can be overwhelming, especially when you have so many application areas in one theater. However, we suggest to take it one step at a time. Retrofit the most important areas first. Which will give you the best payback or the best visual improvement? Not sure? We can help with the number-crunching.